- Gifts one way attack the small gift (with the same color) hanged to the tree. Although this map is defined as "limited edition map" because it was developed behind the scenes for the associated event, this topic has been created to provide to you a place where you can make suggestions, comments or report problems with the map. Please use the following topic only for these purposes. What's the deal with the "2-player adjustment" on this map? Now if I go second, I only get to deploy 2 troops on my first turn? Where's the reasoning behind that? Not to mention it's not written anywhere in the legend, so it's just a little "surprise" you get after joining the game. In a 2 players game you should receive 3 troops not 2, but if the first to play takes a your region...yes, you start deploying just 2. Honestly it's passed some time, I don't recall why MrBenn added that 2 player adjustment (it applies if you hold 4 gifts), probably it's to not give a bigger advantage to the first player. But you need to wait for his answer for more details. thenobodies80 wrote: In a 2 players game you should receive 3 troops not 2, but if the first to play takes a your region...yes, you start deploying just 2. Yes, that's what happened - he took one of mine on the first turn. I'd much rather he start with 4 and knock me to 3 than start with 3 and knock me to 2. It would make sense if everyone had a minimum of 3 deploy, but as it works now, I don't see how it takes away the advantage. Regardless, it should be noted on the map. It's too long ago to remember fully. You have to remember that you get +1 autodeployed onto the gifts... I'd be happy to fix it so that you only get 3 gifts each - when the xml was written it wasn't possible to do that. As an aside, it had always been my intention to have a mini contest every year to update the advent calendar pictures. I'm not averse to revamping this map either, although for me it's a real celebration of Christmas - those who think it looks like it was drawn by a child should bear in mind that the tree/star are made of child hand/footprints and the presents were drawn in crayon by a 4yr old child. But, what is the point of the advent windows? I am able to bombard windows that are +/- 1, but I can't conquer them. So what is the point in having the windows? I guess I just haven't figured out how it is possible to lose a window yet. If you lose all of your advent windows, you are eliminated. 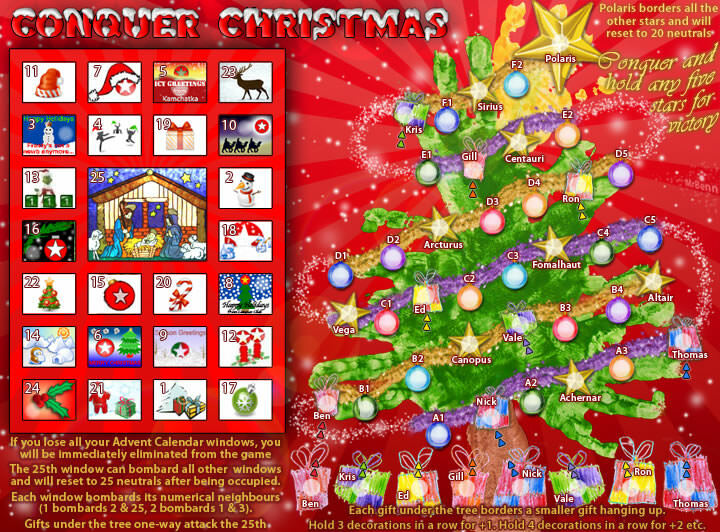 The centre window (25) can bombard ALL advent windows. You can access the 25th window via your present under the tree. Be careful though, if you don't eliminate all of your opponents, the centre window will reset to 25 neutrals at the beginning of your next turn and you will lose all of your remaining troops that are on it! 2. If a territory is said to border another does that not imply that it works vice versa? (I guess not) Wouldn't it be better to say that the gifts under the tree one-way attack gifts on the tree rather than "borders a smaller gift hanging up"
3. Does window 25 reset to 25 neutral at the end of your turn, or at the beginning of your next turn? "After being occupied sounds to me like immediately after your turn ends, but I don't know if the XML would even allow that, so maybe its a non-issue. About #1 and #2 I will contact MrBenn, but he is not so active on the site. Some maps have special neutral territories known as 'killer neutrals', which will reset to neutral at the beginning of the turn of the player who occupies it. Killer neutrals do not reset if they are already neutral. I just wanted to say that this is a great map, I wish it was year round. HA but then I fee the same way about Christmas. NO! I guess I will have to wait until next Christmas to play this again. Any chance of it coming into a rotation more than once a year? kmhebert wrote: NO! I guess I will have to wait until next Christmas to play this again. Any chance of it coming into a rotation more than once a year? Any chance of December 25 coming more than once a year? 1) you cannot "capture" the gifts under the tree; you only get the ones you receive at the start. From that point of view it's kind of trivial, and there's no point taking up space on the map with information that every player should be able to work out on their first turn in any case. 2) The arrows on the map only point in a single direction, to help emphasise that they are one-way attacks. 3) Nobodies already answered this. PPS. Yes, I know it's April. Maybe this affects other maps, but the combination of killer/reset neutrals and victory conditions really confused me. I studied the map when I started playing it and could have sworn I found games where the end-game order was 1. Victory Conditions, 2. Killer Neutrals, etc. Now I'm wondering if I was looking at another map and the order works differently on different maps? Probably I just mis-read something. The issue is that Polaris is a star. Theoretically it should count as one of the 5 stars you can hold for the victory condition. In fact, BOB reads it as one of the stars and shows a person with Polaris +4 other stars as having the victory conditions. So in a tournament game I'm playing I allowed another player to hold the objective thinking he would win (and give me 2nd place in the game for points). However, Polaris reset first on his turn and it didn't count for victory. Is this a standard order of calculating end-game? I don't even know if it would affect other maps. I feel like complaining to BOB though, since it helped to reinforce my delusion. jonofperu wrote: The issue is that Polaris is a star. Theoretically it should count as one of the 5 stars you can hold for the victory condition. In fact, BOB reads it as one of the stars and shows a person with Polaris +4 other stars as having the victory conditions. It seems that "the moment you press the "Begin Turn" button" would precede "the beginning of the turn". Either the instructions or the game engine need to be fixed, because I would call this a broken feature as-is. I can't remember how it's coded, but I would've expected Polaris to have counted as one of the 5 stars within the victory condition. Some maps have 'victory' objectives, which you must conquer and hold for one round to win the game. If you are holding an objective (and none of the objective territories are also 'killer neutrals'), you will win the game at the moment you press the "Begin Turn" button. Polaris does not count towards the objective. Well, then that goes back to jonofperu's original post, and it should be indicated as such on the map. I agree. Referring to holding "any" five is clearly misleading. Instead of changing the wording, you could change the pictures - so polaris could be changed to a fairy, or the other stars could be changed to bells. *It wasn't until round 7 of my first game when I reached someone else's gift that I realised I couldn't attack their main gift. It would be simple enough to change "borders" to "one-way attacks", to make it clear. *While I accept killer neutrals is explained in the main game rules, would it hurt to change that rule to: "Window 25 can bombard all other windows and will reset to 25 neutrals as your next turn begins" - which fits in the same space? Also - and the thing that brought me to this discussion - is it written in any rules anywhere explaining that in trench games you can conquer and carry on attacking from a neutral? Luckily I've had a look at some other trench games as I thought I'd only be able to win by capturing five stars. 1) there are one-way arrows on top of the gifts. 2) it does say it will reset? seems clear enough. 3) it is explained in the general rules that you can attack through killer neutrals in trench games.